Three legends, a pubstar, and their boss: what's up with China's new Dota 2 squad? Newbee.Boss could launch the pro career of China's top female Dota 2 player. Photo credit: Adela Sznajder/ESL. ChuaN is one of the most experienced figures in the Dota 2 scene. With the announcement of the 2017 edition of the Dota 2 Asia Championships in Spring, it’s a make-or-break period for Chinese teams. After invites were handed out, a curious squad was announced by a famous team. Newbee.Boss, a revamp of a pre-existing B-team, includes a mix of three established players, ChuaN, Ferrari_430, Xiao8, and 'newcomers' axx and Zei9. To the confusion of those who are unfamiliar with the fresh faces, the team has been called a 'troll' team, not to be taken seriously in the long run. Meanwhile, the Newbee Weibo playfully stated: “Yes, they are serious~”. So what’s really going on? According to fans aware of the Chinese scene, the indicator of whether or not the team is legitimate is “the boss” Zei9, who is reportedly… well, literally their boss. One of the owners of Newbee is playing on the squad using that handle, according to reliable sources. He apparently isn’t too bad, as he’s reportedly in the 6k MMR range and trains regularly under ex-competitive player SanSheng. According to a Reddit comment by a user who has translated Chinese Dota 2 content previously, “People used to jokingly say the most hard working Newbee player is Zei9.” Past images have shown the CEO in the 5k MMR range (circa TI5) and some fans on social media claim they have seen this player in action on ChuaN’s stream. Meanwhile, new recruit axx has the Dota 2 community talking up a storm. After all, she is the most recent woman player to be given a shot at making it to a large-scale LAN—and it’s no token appearance, if her stats tell the story. She ranks in at an incredible 7100 MMR, and her tournament match win rate, according to DotaBuff, is an impressive 55% in 539 recorded games (with an even more astounding 65% pub rate). Axx plays a magical Invoker, about 75% of 33 games, and has a strong record on other carry heroes including Alchemist, Shadow Fiend, and Slardar. Having played in leagues with other major names such as fy and old chicken, the popular streamer and in-house player could be an essential core for the new team and a strong new presence in both the Chinese scene and abroad. Even with the lack of competitive experience of the two new players, the notable veterans in the squad are a force to be reckoned with. Those who are familiar with the Dota 2 scene will recognise all three of them as International winners. The Malaysian support ChuaN is a mainstay in the professional Dota 2 scene. 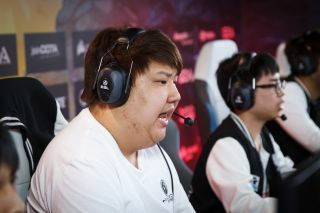 As a part of Invictus Gaming, he won The International 2012, which started the West-to-East back-and-forth pattern seen in the annual Valve tournament. Since then he's had a rollercoaster ride in regards to his Dota 2 success, as other International victors have historically suffered. In late 2015, he left IG and joined Newbee instead, though he worked through similar ups-and-downs under this banner. He was last seen on the big stage at TI6 in August, where Newbee took the 9th-12th place slot; after this low placement, the took an indefinite hiatus from competitive play. Newbee's championship team at The International 2014. ChuaN’s ex-teammate and fellow TI2 winner Ferrari_430 has been hidden from the scene for a bit longer than ChuaN. According to his official DotaBuff record, the mid player’s last premier game with his former squad IG took place seven months ago as part of the TI6 China qualifiers. Since then, like many other high-rank players in China, he has been engaged in in-house leagues until his re-emergence into this new squad. The team’s third International champion and captain Xiao8 won in 2014 as part of the core team of Newbee. Don’t be fooled by the relatively late win, though—the player has been around since 2010, notably in the first TI with IG in 2011 and with LGD in 2012, taking third place after being knocked out by some of his current teammates. In fact, he is one of the few players remaining who has made an appearance at the main event of every iteration of The International (Every. Single. One. ), regardless of team affiliation. Most recently, he qualified for Boston as part of LFY (LGD.Forever.Young), but the team fell to eventual second place winners Ad Finem. He supposedly 'retired' after Boston for at least six months, though given Dota 2’s history of 'retiring' players, the meaning of this word may need to be reevaluated. Technically, this was his second 'retirement', as he did so after TI4 and returned in a serious manner not too long after. Still, it could contribute to why the team is not taken seriously. So now that we can understand who all of these players are, we can start asking—what’s the deal with Newbee.Boss? Most likely, the speculation of the community is correct: this could be a 'just for fun' team, albeit with eyes on the main stage of DAC alongside the main Newbee squad. Between xiao8’s re-rise from retirement and the CEO of the company joining in, fans have found little reason to treat the squad like their A-team counterparts. Even with axx’s skill, some believe that she’s on the team just for kicks due to her streaming background. To be clear, this fan-pleasing combination of well-known players with personalities isn’t unfamiliar in Dota 2. In the Western scene, NA’s Vegetable Esports Club is a ragtag team of rogue pros and English casters that fights through qualifiers for several tournaments. It’s a worthy effort, as VEC only lost in the Boston Major NA open qualifiers to ProDota, the cross-server EU team that eventually fell in the main qualifiers. Given Dota 2's frequent use of open qualifiers, squads of free agents pop up often with varying degrees of success. Most recently, Evil Geniuses CEO and ex-captain PPD formed his own squad with several other pros for the Kiev Major qualifiers. While Newbee.Boss may just be a fun dream team to play on for Newbee's boss, it’s certainly not an unworthy squad. During the Dota 2 Asia Championship 'pre-qualifier' for an abandoned qualifier spot, Newbee.Boss looked strong in their first matches against Calvary and Rush.B, displaying a strong sense of team cohesion, Newbee.Boss cleanly took two games straight per match. In fact, zei9 performed skillfully among the chorus of pros. The team must now fight through main qualifiers, full of powerhouse teams such as EHOME, LFY, and IG, but this means that they have a very real shot at making it to the main event. Newbee.Boss is a strange mix of long-time legends and complete unknowns. After all, “three Chinese legends, a strong female player, and their boss make a gaming squad” sounds like the start of a cheesy joke (or a Hollywood movie). Even so, while some of the former TI champions have come in and out of relevance, this formation could let axx break out into the international scene—and give Newbee's boss a taste of the glory that he's helped others achieve.